Do you like horses? - Can you help others achieve balance in their lives? - Volunteer! 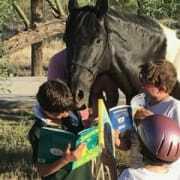 Equine Therapy AZ, "Horses with Wings"
Do you like giving back to your community, and feeling appreciated when you do. There are so many volunteering opportunites out there and we are grateful that you took the time to read about our organization. We are a non profit therapeutic riding program whose focus is on the military and children with developmental disabilities, particularly Autism. What we need the most however are people to walk side by side with the horses during the lesson and help the horse handler maintain safety for the child. We need volunteers who can promise coming in at least once a week for a five or six week block of time to help with lessons. Volunteers will be expected to come to meetings and workshops, where our staff will teach basic horse handling techniques in order for volunteers to feel comfortable enough working around the animals. Our main goal outside of providing an awesome experience to the children and adults in the lessons, is to keep everyone involved including horses safe. 3 More opportunities with Equine Therapy AZ, "Horses with Wings"